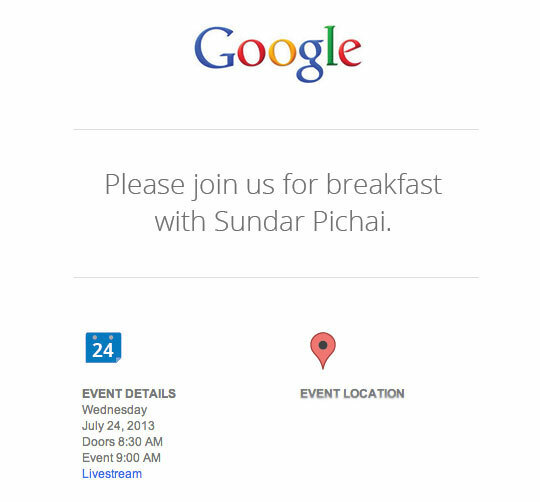 Google has just sent out invitations to members of the media inviting them to an event on July 24 in San Francisco to have breakfast with Sundar Pichai, its Senior Vice President for Android, Chrome, and Google Apps. At this year’s Google I/O developer conference, it was Pichai who took to the stage to announce that there were 900 million Android activations and 48 billion apps downloaded. Whatever the announcement is, it will be big as the event is going to be livestreamed on Google’s YouTube channel.